You are welcome to the site FOX-NOTES dedicated to Bonistics – collecting and study of paper currency. The site contains the catalogue of paper money of Russia and foreign countries which is the largest known by the number of images – in December 2014 there were more than 31,000 illustrations. Moreover, it is being constantly and actively expanded. Forum is also available. Article on bonistics, bibliography, legislative acts on money circulation, archive documents as well as other information materials are also included. The site started to function on May 14, 2005. You can get acquainted with currency notes available for sale at the SHOP section of the site. The site is entirely in Russian language. CATALOGUE – catalogues of banknotes. It is the main section of the site. Special attention is paid to the notes of Russia and countries historically connected to Russia. Free access. FORUM – forum. Language of communication is predominantly Russian. Only registered members can take part in the forum. INFORMATION – articles, documents on monetary circulation. Literature. All the articles are in Russian. Part of the documents is in English or German. 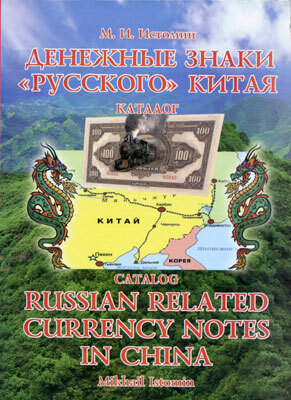 This catalog considers the Russian related paper money issued in China from the end of the 19th century through the beginning of the 1920s. A separate chapter is dedicated to the Soviet war issue of 1945. The earlier issues include both the currency notes of mandatory circulation and private money. Except for the issues of the Russo-Chinese / Russo-Asiatic Bank until 1918 all other money was issued in Manchuria, in particular in the Chinese Eastern Railway strip. There is historical and other background information in each article. The notes are priced in US dollars, usually for three grades. The majority of the issues are illustrated. The differences between the varieties are explained in words and when possible, shown visually. Many notes are illustrated for the first time. Recorded serial and control numbers are widely represented. The catalog is intended for a wide range of collectors, both beginners and advanced.